The Old Foodie: The first pineapple tart. The pineapple is a native of South America, and it had been cultivated there for centuries before Christopher Columbus saw one in Guadeloupe in 1493. 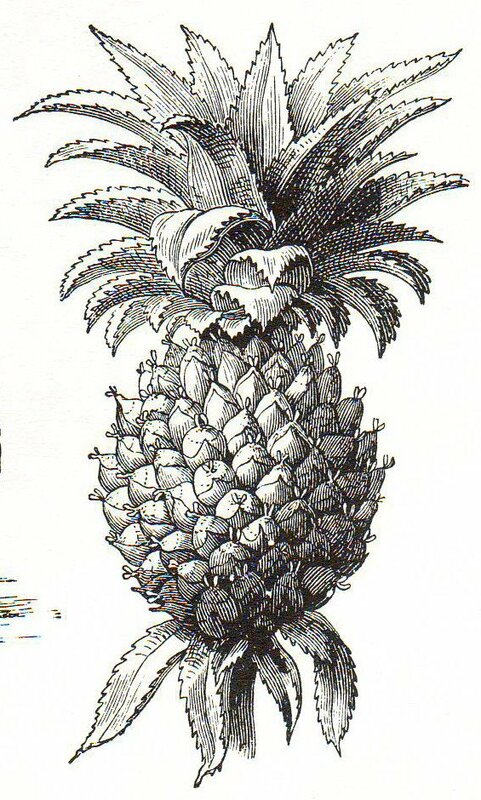 Unlike the other New World finds of potato and tomato which were seen for a long time as foreign therefore suspicious if not downright poisonous, the pineapple was seen immediately as foreign therefore exotic and absolutely worthy of presentation to the King. Much horticultural expertise and hothouse experimentation resulted in England’s first home-grown pineapple in 1719, but it remained an expensive treat for a couple of centuries until the Hawaiian canning industry took off at the end of the nineteenth century. The first published recipe for pineapple appears in Richard Bradley’s “The Country Housewife and Lady’s Director” in 1736, and it still sounds delicious. To make a Tart of the Ananas, or Pine-Apple. From Barbadoes. Take a Pine-Apple, and twist off its Crown: then pare it free from the Knots, and cut it in Slices about half an Inch thick; then stew it with a little Canary wine, or Madera Wine, and some Sugar, till it is thoroughly hot, and it will distribute its Flavour to the Wine much better than any thing we can add to it. When it is as one would have it, take it from the Fire; and when it is cool, put it into a sweet Paste, with its Liquor, and bake it gently a little while, and when it comes from the Oven, pour Cream over it (if you have it) and serve it either hot or cold. Even canned pineapple was a delicacy in late Victorian England, if we can draw any conclusions from its use in “High Class Cookery” (1893), by Mrs. Charles Clarke. Three ounces of pineapple; three ounces of Flour, sifted; three ounces of sugar; two ounces of Butter; Half a pint of Milk; Yolks of three Eggs; Whites of four Eggs. Melt the butter in a stewpan, and add the flour and milk; cook well; add the sugar and the pineapple, previously cut into dice; add the yolks one by one; whip the whites very stiff; stir in the mixture very lightly; pour into a prepared soufflée mould; steam one hour. Reduce one gill of the syrup from the pine-apple, add one ounce of loaf sugar, and one glass of sherry; colour with cochineal; pour round the pudding. Some small pieces of pine-apple may be added to the sauce. A great week of fruit posts, O.F.! Very, very fun and interesting stuff. Me, I like my pineapples upside-down, but that's just me.